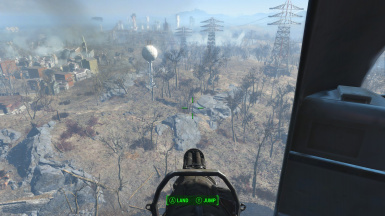 A F4SE plugin that lets you jump from vertibirds. Support for game version 1.10.75. Support for game version 1.10.64. Support for game version 1.10.50. Support for game version 1.10.40. Support for game version 1.10.26. Support for game version 1.10.20. Plugin now checks game version and auto-disables itself on version mismatch. Grey out Jump button if F4SE not loaded. Fixed issue with CTD when jumping off a vertibird. In Data\F4SE\Plugins\vertibird_jump.ini, set bSafetyCheck=1 to turn on this feature. This is a F4SE plugin that lets you jump from Vertibirds. 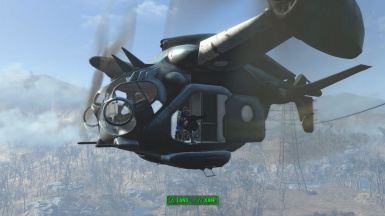 In addition to the Land option, there is now an option to Jump from a vertibird while in-flight. For obvious reasons, make sure you are either in Power Armor or have a jetpack equipped! If Jump is greyed out, you forgot to launch the game with F4SE. 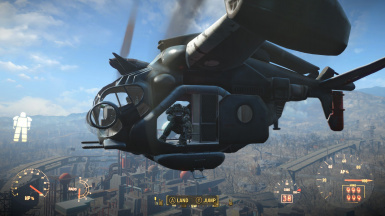 Jumping from vertibirds was an advertised feature of Fallout 4 and was in the E3 trailer, but it was conspicuously absent from the release version of the game. 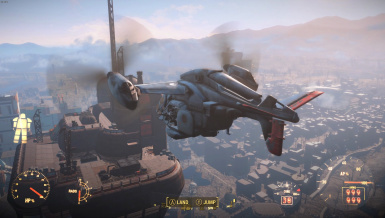 Even the Vertibird page on the Help section in the pause menu still says that you can jump from them! 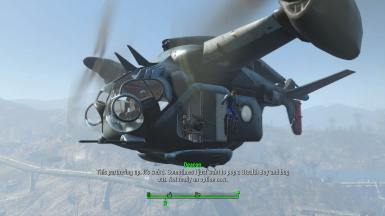 Extra useful in survival mode - no more having to wait for the Vertibird to land. Requirements: Fallout 4 v1.8.7 or higher. I do not use Mod Organizer and cannot offer support for installations via MO2. If you want to restrict vertibird jumping to only when you are in Power Armor or have a jetpack equipped, set bSafetyCheck=1 in Data\F4SE\Plugins\vertibird_jump.ini.